This release is primarily about adding support for iPhones and iPads when they are using Web Forms. 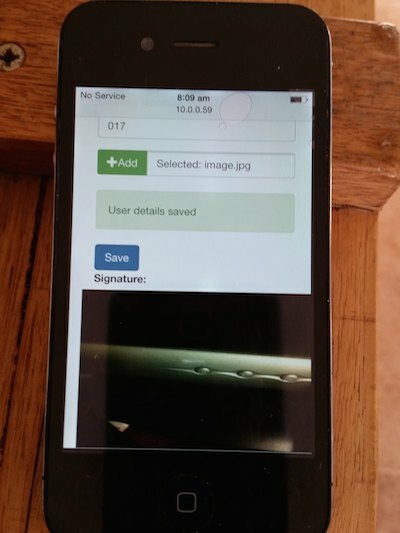 You can now take photos, and videos with your iPhones when completing smap surveys. I’d like to thank Zarkman for donating an iPhone to Smap Consulting in order to help with the testing of this new capability. You can now complete surveys on your iPhone and iPad using WebForms. These surveys can included images, video and GPS coordinates. If you conduct surveys that don’t take pictures then they can be submitted offline and will be stored until you have a network connection. However, when using an iPhone, if you take pictures as part of your survey then you will not be able to save the results as draft. Also if you are offline when you submit, then the results will not be stored to be submitted when you are back on line. You will need to stay in the web page until you get a network connection and then re-submit. You can open multiple pages in order to complete multiple surveys, with images and offline, while using an iPhone. To complete a survey on your iPhone, use Safari to go to your server. Then select WebForms and finally select the big blue button for the survey you want to complete. This capability was in large part enabled through upgrading to the latest version of enketo-core as well as being assisted by the sponsorship of Zarkman. Thanks to the the new version of enketo-core you can layout your web forms in a grid. 2. Add w1, w2 etc to the appearance columns of questions that you don’t want to appear full width. 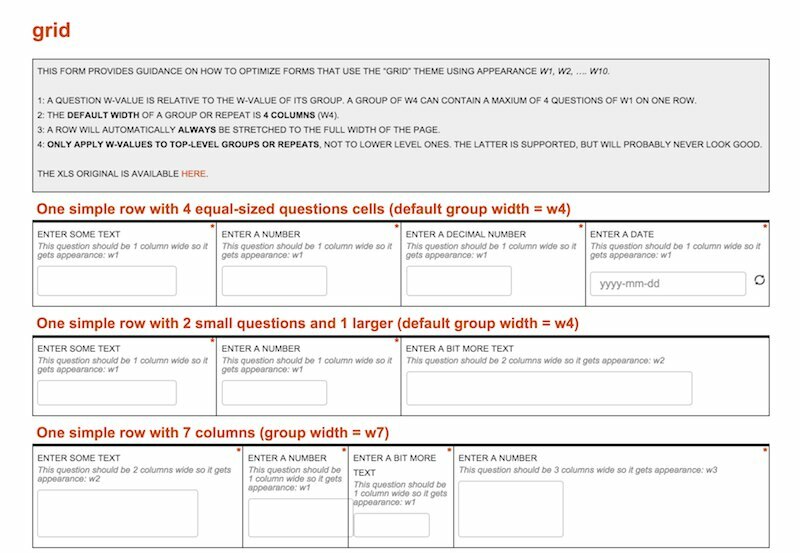 This example form from enketo has more detailed information. The email address to which to send a notification can now be obtained from the survey results. When creating a notification specify the question from which to get these addresses. This can be a select one, select multiple or text question. They question can be in a repeating group in which case all the emails entered will be used as the “to” address for the notification. To specify multiple email addresses in a text question separate each email address with commas. The names of choices in a select multiple question are used to create the data base table that stores the results. These database column names cannot contain ‘@’ or ‘.’. Hence for select multiple questions you have to modify the way the email address is specified. In select_one and text questions you can simply write the email as normal. You can now specify the text to be included in an email notification. This can be specified for each notification. Alternatively a default email text can be specified in the organisation settings. The email domain to be used for emails can be specified at the whole of server level in the “server” table. Alternatively it can be specified for the organisation in the organisation settings. You can attach a PDF of the results to an email notification. A PDF will be automatically generated using the same grid layout as is available for WebForms. However in this release its still very much beta code. More usefully a template for the PDF can be specified in the surveys settings. Go to the survey editor and click on the “File” menu and then “Settings”. Fields in the template that have the same name as a question will be populated with the results of the question. PDF’s can also be downloaded from a table view of the survey results. Goto the analysis page and create a table containing the survey results. A menu button will be shown to the left of each record. If you click on that you have the option to download a PDF or open a WebForm containing the record. Note this feature is only enabled if the ability to edit surveys is specified in the organisation settings. If you rename a survey or delete it and then restore it then you can still download the XLS form that was used to create that survey. The following issues have been fixed. The default language could not be specified in the settings for the survey. If you had two levels or more of repeating groups then when you exported results an unnecessary row containing data from the main form would have been added to the results. Filter values used in cascading selects were not allowed to have spaces. When exporting surveys with more than one “/” in their name then the export failed. I have updated the released code to address some relatively minor bugs. The xls template for editing forms has been updated to include the settings tab and a column for the “style”. You can use this to format web forms in a grid. Updated for a very significant bug. The web forms code was not included in the previous release! So if your web forms was looking a bit flat and not responsive to relevant conditions then this would be why. Installing this the .03 version should fix it. This entry was posted in Uncategorized and tagged fieldTask, iphone, odk, pdf on April 22, 2015 by Neil Penman. Sometimes your forms need to change quickly. One such case was suggested by World Vision staff who are working in Syrian refugee camps. They wanted to record school attendance however new children are arriving daily and hence the attendance roll would be also changing daily. Putting choices in a CSV file separate from the form can be the answer. The file name is specified in the “appearance” column. In the example below the choices will come from the “children.csv” file. The other parameters to the “search” function are filters so that only children in “class1” are included. and, CSV files can be attached to a single form or shared by all forms in the organisation. This demonstration shows information on new school enrolments being collected using a form and then being added to a CSV file. This file is then used to record attendance in school and is also used by a separate form to record vaccinations given to the children. The data can be used in multiple forms because it is loaded to the “Organisation” tab in the media page rather than the “Form” tab. If you loaded different files with the same name to “Form” and “Organisation” then the file at the “Form” level will take precedence. The files for this example can be found here. The back office team copy the details on the new children and put them into the “children.csv” file. They upload this file to the Smap server where it replaces the existing file. The next day, before recording attendance, the Teacher presses “refresh” in fieldTask to get the latest form. They can then mark off the attendance of all the children including those that arrived the day before. A medical specialist using a form called “vaccinate”, presses refresh in fieldTask before checking the children in a class. This will load the latest vaccination details into their phone. The video showed a back office worker manually copying the daily enrolment data into the children CSV file. This task could be automated by implementing a custom web page. Apart from saving some effort for the back office administrators this would also apply updates faster resulting in more current data. CSV files storing data can be used in other applications, not just for school enrolments and vaccinations. For example asset management, managing workforce etc. This entry was posted in Smap Hints and tagged fieldTask, odk, school enrolments, wfm, work force management on January 13, 2015 by Neil Penman. Version 14.09 of Smap is available for download. The refresh button on fieldTask now does more than just clear the submitted results from the screen. It also now refreshes the forms that you have on your phone and submits any finalised results. 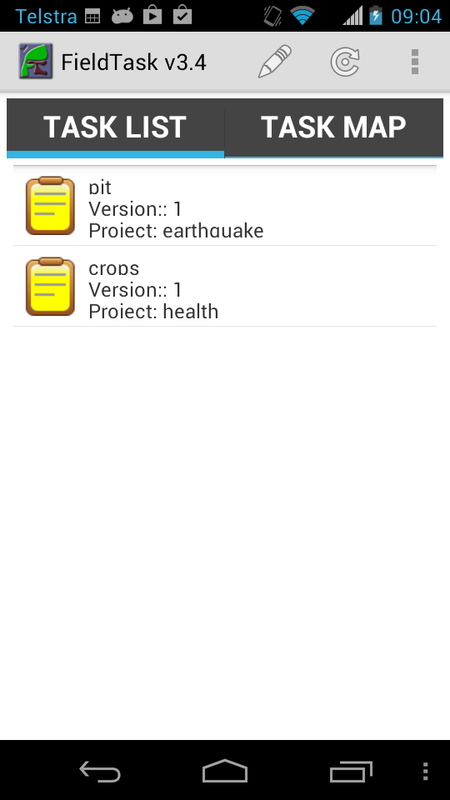 Note you will need to download fieldTask version 2.3.5 from your server on to your phone to use this new feature. You can select a form from the task list screen to complete a survey. 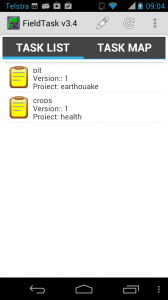 The name, version and project containing the form are shown next to the icon. This new feature should simplify the training of the data collectors as the steps they need to download new forms, start a survey and submit results are all simpler. Sometimes it can happen that data collectors go out into the field with the wrong version of a form on their phone. At worst this may have an impact on quality of the collected data and at best you will need to do some messy combining of the data from the two forms prior to analysis. This new feature makes it much easier to check that all the data collectors have the correct version of the form. From the monitor page select forms. This will show the users, phones, downloaded forms and the versions of those forms that have been downloaded. Any users / phones that have not downloaded a form or have an older version are highlighted. You can now export results to the Neo4J graph database. This change was developed in collaboration with thingsat. The following video shows how this can be done. You can edit collected data using web forms. This capability is enabled by an administrator for your organisation. By default it is off. If you select a table showing data for the whole of survey then there will be a button next to each data record that will open the survey results in a web form. If the data is updated the old results will be marked as bad, and then the updated results added. This entry was posted in Smap Release and tagged assessment, fieldTask, neo4j, odk, Smap Consulting, thingsat on September 22, 2014 by Neil Penman. Announcing the release of Smap Evaluation Tools Server version 13.12. The time series analysis functionality in this release has been funded by the Speed Evidence project. This is to assist in the long term response to Typhoon Haiyan. Time Series Analysis. Showing trends over time using graphs, maps and tables in the analysis module. Server side calculations. There are only two functions available at the moment; area of a polygon and length of a line or the perimeter of a polygon. However other functions could be added such as the calculation of Z-score anthropometric indicators. Export of attributes from parent forms to shape files. If you select a child form containing a geometry and export to a shape file then all the attributes of the parent (up to the maximum of 255) will also be exported. Specification of default language. The default language to show on the phone can now be specified by selecting “view/edit” link next to the survey name on the template management page. Support for Internet Explorer has been improved however it is still not supported, that is I haven’t tested this release against IE. Hosted servers will be progressively updated over the next week or so. The download for this release will be available by the 19th of January. This entry was posted in Smap Release and tagged data collection, field task, gis, graphs, maps, odk, Smap Consulting, time series on January 12, 2014 by Neil Penman. Dashboard panels are now only viewable by the user that created them. No more sharing! The concept of sharing all dashboard panels worked reasonably well when a project team was working collaboratively on a project. But there were still issues, for example when a team member wanted to do some experimentation with graphs. However there were significant problems during workshops when 30 odd people were creating and deleting panels independently and the system was trying to keep all of the panels in sync. So I came to the conclusion that no-sharing is better than sharing everything. If anyone has any ideas on how to introduce some managed sharing back in to the dashboard panels let me know. fieldTask works a little differently. The menu option “get new forms” now goes direct to the server. If you want to delete forms or data from the phone you will need to select “delete forms” from the main menu. This entry was posted in Smap Release and tagged assessments, data collection, DME, fieldTask, odk, odkCollect, Smap Consulting on May 1, 2013 by Neil Penman.